It had been the kind of experience that I desperately was hoping my sons would have in Tanzania. Like many families, we’d come to East Africa to go on safari and see the “Big 5” - African elephant, black rhinoceros, Cape buffalo, leopard and lion, plus cheetah, giraffe, hippopotamus, and zebra for good measure. 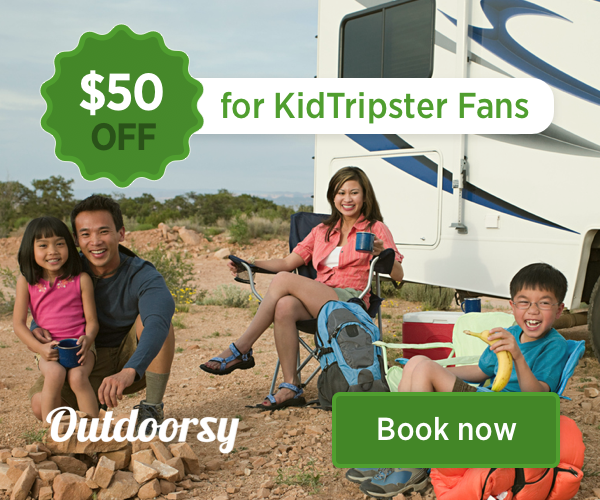 I’d booked a 5-day budget camping safari with Duma Explorer. On our way to Serengeti National Park and Ngorongoro Crater, we arranged to spend a morning with the Hadzabe tribe. It was a sizable detour, but those few hours turned out to be the most memorable of our trip to Africa. The Hadzabe people have lived around Lake Eyasi in the central Rift Valley and the Serengeti Plateau for more than 10,000 years. With a population of less than a thousand, they're the last full-time hunter-gatherers in Africa. Today, their way of life - unchanged for centuries - is severely threatened by encroaching farmers and herding tribes. It isn’t easy to find them. The tribal groups often relocate their villages based on hunting conditions. On this day, my sons and I piled into our Toyota Land Cruiser with our driver, a newlywed couple from Ireland, and Hassam. We soon left the two-track dirt path that passes for a road in these parts to follow a series of even less-distinct footpaths through the bush. After a 30-minute drive, we hopped from the Cruiser and headed off on foot. As we walked, Hassam voiced a series of clicks, the sounds that make up the Hadzabe language, and listened for a return. 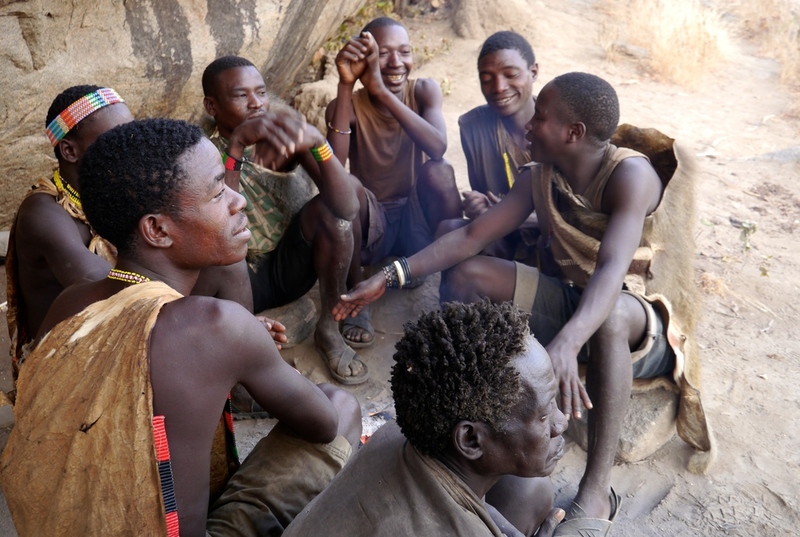 We found the young men of the tribe, adorned with brightly-colored, beaded bracelets and headbands just outside of the camp, warming themselves by a fire before the morning hunt. The air was crisp, and while they wore very little clothing, we were bundled in polar fleeces. The tribe’s elder - his face weathered by sun and struggle - crouched fireside to give moral support to the hunting party. 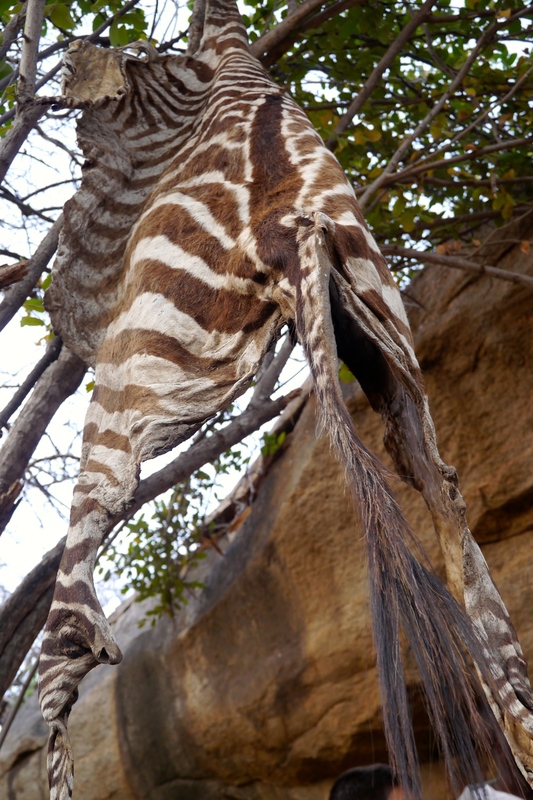 Hanging in the tree next to them was a zebra skin, a trophy from last week’s kill. On a stake nearby, we saw the skulls of baboons. It’s customary for a male suitor to present the father of a would-be bride with a baboon kill. Hassam taught us how to say hello by clicking. It was frustratingly difficult, and only Aidan seemed to master the correct sound. The men were cordial but generally unfazed by our arrival. We moved to the main camp, where the young girls of the tribe were huddled around another fire. They passed a metal pot, drinking a diluted breakfast broth. I couldn’t help but notice the scars on their faces. Hassam told us that when children are young, the chief cuts their cheeks with a sharp blade. If the children cry, their salty tears roll into the cuts, causing a painful stinging. That pain apparently leaves an impression and teaches them not to cry in the future. At this explanation, both Aidan and my 13-year old son, Nathan, shot me a look of total disbelief. Then it was my turn to be surprised as Hassam called me over to one of the huts. Inside, a 14-year old girl - married - lay on a blood-stained grass mat, clutching a small baby. The girl gave birth less than 24 hours earlier and was still moaning in pain. My mouth dropped open, realizing that she and my son were nearly the same age. Outside the hut, the boys were in training. The hunters were showing them how to nock their arrows and pull back their bowstrings. These were serious bows that required a great deal of strength to draw. The men seemed amused when I picked up a bow and took aim at the target. Clearly, women do not hunt here. I was a fairly good shot but decided to relinquish my bow out of respect for their tribal customs. The hunt was on. For the next two hours, we stalked prey in and below the trees within a five-mile radius of the camp. Nathan, reluctant to engage his primeval hunting instinct, was happy to trail behind the hunting party. Aidan, however, was in his element. With his bow at the ready, he chased after the youngest bushman, who had taken a liking to him. I couldn’t keep up. The hunters were quick, light-footed, and extremely skilled. Later I learned that they had smoked a marijuana-like plant prior to our arrival, presumably to heighten their senses for tracking. As Aidan slipped out of sight for a full 30 minutes, I was glad that I didn’t know about the drug-induced high at the time. When I finally caught up to Aidan and his hunting partner, I got a glimpse of them bent down, the bushman’s hand on my son’s arm, quietly stalking their prey - a sand grouse sitting on a tree branch. As they got closer, the young bushman coaxed Aidan to raise his bow and fire. It was a miss, but Aidan beamed with pride nonetheless. Others in the hunting party had been more successful, as evidenced by a string of dead birds around their waists. They stopped, plucked the feathers, and roasted a bird on a fire that they started within seconds. They offered us very rare pieces of meat. Aidan and I accepted; Nathan politely declined. He did sample the sweet honeycomb that the men swiped from a beehive hanging in a nearby tree. As we arrived back at camp, we saw the girls making beaded jewelry. I happily offered to buy mementos of our morning with the Hadzabe. I selected a bracelet of elephant grass; Aidan chose a necklace made with the antlers of a dik-dik, a small antelope. He wore that necklace every minute of every day for the remainder of our time in Africa. While I appreciated our souvenirs, what I remember most about that day is the smile that Aidan wore, fully engaged with the Hadzabe whose way of life is slowly slipping away. I highly recommend Duma Explorer, the company that allowed us to add the Hadzabe hunt to our safari itinerary. Other safari providers offer similar excursions. However, ask questions to be sure that you’re signing up for an authentic experience. Some providers will simply make a tribal stop, where you get the distinct impression that you’re one of many tour groups that the tribesmen are ushering through their camp that day. Those experiences will leave you with a very hallow feeling. For more on choosing the right safari for your family, click here. Editor Shellie Bailey-Shah and her sons visited Tanzania as part of a 72-day around-the-world adventure.